Below is an information timeline of the events concerning Stony Ridge Observatory during the wildfire in the Angeles National Forest during August-September 2009. Named the Station Fire, burning over 161,000 acres, it is the largest wildfire ever recorded in the history of Los Angeles County. 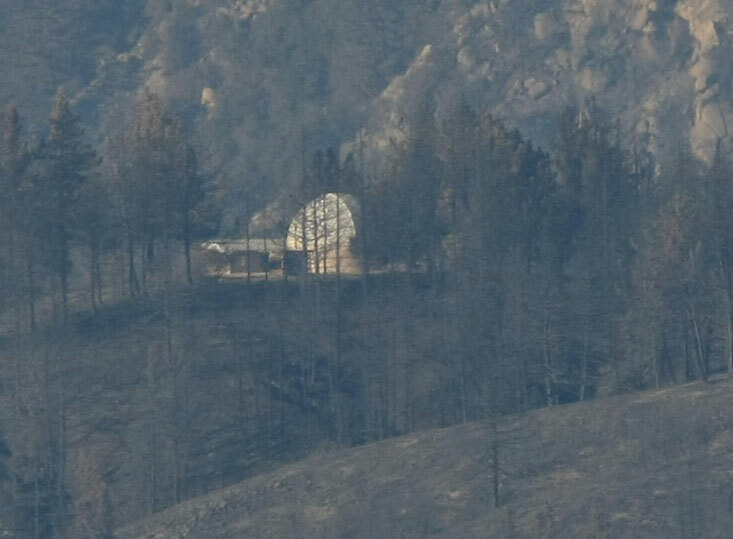 Although Stony Ridge Observatory received only minor damage, the surrounding forest was severly burned. Other details about the Angeles National Forest and the Station Fire may be obtained at the U.S. Forest Service - Angeles Forest website. Station Fire Initial Attack Review - November 13, 2009 - 3.2MB PDF file. The WHEN, and WHERE the fire started (with photos) and HOW it was initially attacked, including a report supporting the Command decisions made during August 26 to August 28. Station Fire Burned Area Report (BAER) - October 16, 2009 - 2.3MB PDF file. Details the effects on wildlife and the ecology in the burn area. and producing pine cones, so it's quite healthy. For photos of the site and of the forest on that day, click here. Saturday, September 19, 2009, 7:21 p.m.
Three members of Stony Ridge were able to visit the site on Wednesday, September 16,and John Rogers took some amazing photos. While we are thrilled that Stony Ridge has,from this first intial inspection, escaped the fire with extremely minor damage, we are also saddened at the loss of the beautiful forest we so much enjoyed and by the knowlege that many others have lost so much. We have comparison photos of what Stony Ridge looked like just a few months before the fire, and what it looks like now. We also have miscellaneous photos of the site's current condition, inside and out. There are more photos, mostly of the forest in general. We would like to express our thanks to all our friends of Stony Ridge, those who have offered support and encouragement, the media, magazines, and many people who have helped to spread the word about our concerns during this fire, the Forestry Service and associated organizations for providing information and being patient with a multitude of calls, Mt. Wilson personnel who provided our first glimpse of Stony Ridge still standing, and Stony Ridge members who have worked to gather and distribute information to members. And especially -- Thank You Firefighters! Monday, September 7, 2009, 9:44 p.m.
Great news! Here is a fantastic image of Stony Ridge Observatory as it appeared today around 6:30 p.m. This photo was taken by Dave Jurasevich, Mt. Wilson Observatory Superintendent, and we really appreciate him taking time to get this photo for us. Our thanks also to Larry Webster, Mt. Wilson's Site Manager for the CHARA Array, who first notified us of seeing Stony Ridge still intact through his telescope and who has kept in touch with us via e-mail regarding our site.Both of them are obviously very busy at Mt. Wilson, and we're grateful to them for taking time to help us. Once again -- Thank you, firefighters! Monday, September 7, 2009, 2:40 p.m.
SRO members have had some good news this morning. Results of a remote visual observation from Mt. Wilson Observatory of Stony Ridge Observatory, made through a small amateur telescope, confirm that the buildings at Stony Ridge are, indeed, still standing. There was also an important comment received saying that some of the trees near the SRO dome had unburned pine needles on their tree branches. This is an indicator that the fire temperature in the area around the dome was not as high as originally feared. The dome itself had no evidence of scorching. There was burn evidence on trees and bushes nearby. Other observations made through a 700 mm telephoto lens from Mt. Wilson at 2:00 p.m. today show Stony Ridge Observatory intact. A photo will be posted on the mtwilson.edu site later this afternoon. It's important to note that, while the exterior indicators are good, having boots-on-the-ground access to SRO and getting an interior assessment of any damage inside the dome and support buildings may not be possible for a yet unknown length of time. Director of the Mt. Wilson Observatory, Hal McAlister, and his spouse, Susan, were able to travel along the ACH between Mt. Wilson and La Canada, and have posted images of that drive at http://www.chara.gsu.edu/CHARA/MWO/CrestPhotos1.php. Sunday, September 6, 2009, 10:41 a.m. The outlook is not good this morning. Heavy fires burned through the area yesterday and last night. ANFFLA is reporting on their web site (http://www.anffla.org/) "We have received news that the Vetter Mountain Lookout Tower (pictured in the header photo of the ANFFLA website) was lost in the Station Fire." The Vetter Mountain tower was within visual distance from Stony Ridge Observatory,on the other side of Angeles Crest Highway. We must emphasize, though, that we have not received any news about Stony Ridge this morning. We are currently checking with sources who may be able to provide us with information, but it may be late evening before we are able to get any news. Further information will be posted here as soon as possible. Saturday, September 5, 2009, 11:09 a.m.
No new information to report. Looks like we may be in the waiting mode for a while. Friday, September 4, 2009, 2:01 p.m.
No new information to report yet today. Thursday, September 3, 2009, 10:36 a.m. I just spoke with Marian Swinney, Public Information Officer with the Bureau of Land Management, who is working with the U.S. Forest Service and is currently answering the phone number I have for the incident command center. Stony Ridge has not been burned! She said they have lost some small structures in the area, but Stony Ridge is still there. She did caution, however, that it is in a current "hot spot." But at least we know for now it is still standing. Thursday, September 3, 2009, 9:37 a.m. The open house that was scheduled for October 10, 2009, has been postponed indefinitely, since access to the site would most likely not be restored by then. The Station Fire in Southern California has overrun the area in the vicinity of Stony Ridge Observatory. Major damage to structures in the area has been reported. The condition of Stony Ridge Observatory is unknown at this time. Forest Service personnel attempted to reach Stony Ridge Observatory via Angeles Crest Highway on Tuesday, but were not successful, due to rock debris on Angeles Crest Highway. Regardless of the outcome to Stony Ridge, we greatly appreciate the efforts madeby the various fire personnel and recognize their hard work and dedication.